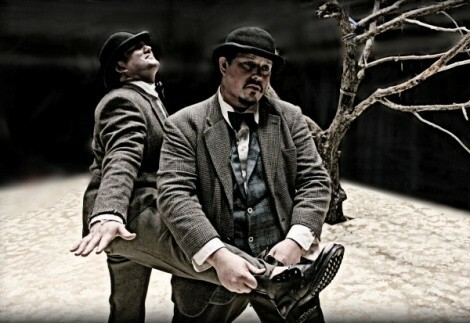 For nearly six decades, Waiting for Godot has remained something of a theatrical Rorschach test for audiences. Samuel Beckett’s absurdist humor and loopy dialogue suggests the play is allegorical—but of what, exactly? The answer to that question seems to reveal more about the theatergoer’s own worldview than Beckett’s. Many people agree the titular non-character Godot—whose name, evidently, most of us have been mispronouncing for years—symbolizes God. And this idea is the fount from which thousands of critical analyses and term papers have sprung. But Godot needn’t be dry, academic and airless. The Sting & Honey Company’s first-ever production invites us to experience the show as a show, and to enjoy its characters qua characters. Javen Tanner is warmly sympathetic as the goofy Estragon, struggling to maintain a kind of wavering balance in the face of this world’s miseries. David D’Agostini storms the stage in his volatile role as Vladimir. In many ways, the effete Pozzo is impossibly loathsome, yet Roger Dunbar brings a sly affability to this role. But it’s the abject, unhinged Lucky (Cam Deaver) who chews the sparse scenery during his incomprehensible glossolalia monologue; Deaver commands the stage with an undeniable physicality and rare presence. It’s a fresh production, with a lovely design, and well worth seeing. Even so, Beckett’s play is still bewildering. It’s difficult to resist the urge to make intellectual sense of it, but that way lies madness. Better to drink it in, in all its delirious perplexity, without over-thinking it. And it’s on that experiential level that this production excels.